"This is a white chocolate version of a classic mocha. 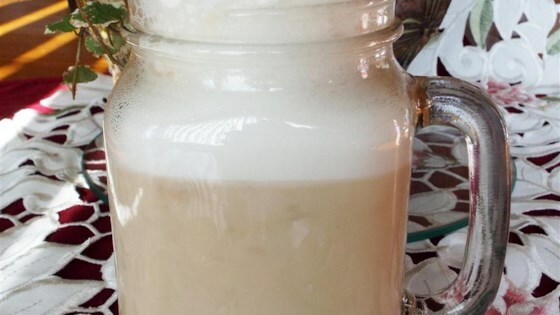 No reason to head to the cafe--stay in and use your home espresso machine to brew up this delicious espresso drink." Pour milk into a steaming pitcher and heat to 145 degrees F to 165 degrees F (65 to 70 degrees C) using the steaming wand. Measure the white chocolate syrup into a large coffee mug. Brew espresso, then add to mug. Pour the steamed milk into the mug, using a spoon to hold back the foam. Top with whipped cream and serve. The starbucks brand white chocolate syrup can be bought on amazon.com, and I can't wait to try it!